Direct spending by resident and international travelers in Europe averaged €3.6 billion in a day, €152.1 million in an hour, €2.55 million in a minute and €42,231 in a second. Supported 12.9 million jobs, including 5.9 million directly in the travel industry and 7.0 million in other industries. Book directly with the owner or managers and save! Save money when travelling with family and friends. Detailed rental information provided on each listing, including photos, rates, amenities, availability calendars and renter reviews. Provide the finest collection of Holiday rentals and Hotels, and B&B online. Connect potential travelers to accommodations owners or managers directly. Display our client's holiday homes at their best. Supply owners and managers with online tools that assist them in the marketing and booking of their vacation. We are so Confident on Our Product that we promise you to provide minimum 2 Bookings. In case, we failed to deliver you 2 Bookings in first 12 months, we will not remove your advert. We will keep on working with your property till the time you don’t get minimum 2 Bookings. At Kingdomofrentals.com, our focus is simple.... To help guests to find the right accommodation and to help home owners to find the right guest. Here travelers will contact homeowner directly and whatever price and dates will be finalize that will be between them. We take No Commission. Easy to use tools: Be administrator of your property. At Kingdom Of Rentals you will be provided An User Name and Password through which you can log in your account and upload property and make it live in a minute, update calendar, access inquiries and bookings, and make the changes you need at any point of time. Meaning in short you are the complete administrator of your property. Kingdom of Rentals has a geographical advantage to provide you best guests from countries which you have always aimed or dreamed about. Kingdom Of Rentals not only cover Southern and Northern Europe with Scandinavia, but also, North America and South America along with Australasia and Asia. 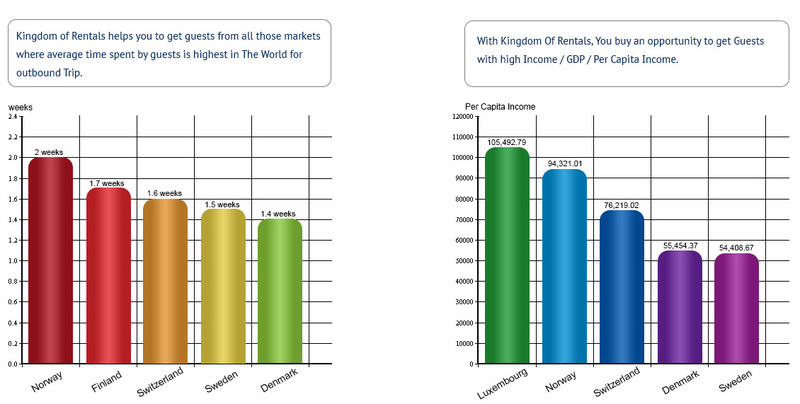 Because of our geographical location, Kingdom of rentals has an edge to cover the entire world guest market. 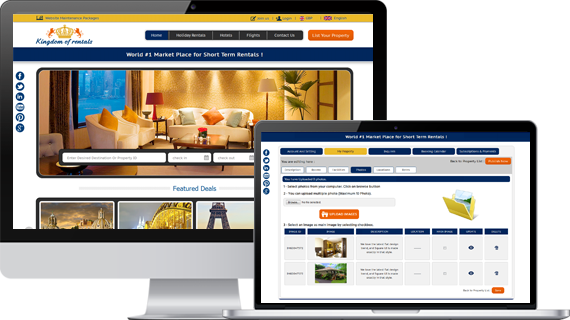 We are one of the smartest online marketing experts for Holiday Rentals in Europe, North America, Asia and Australia. Personal Website Link to allow your travelers to know more about your other properties and services. Unlimited text description to explain your property with No limitations. Map to help guest find your exact location and nearby destinations and attractions. Availability Calendar to update your bookings. Rate Card to help travelers to check the property in their budget. Direct Inquiries from travelers to get familiar with property and owner before reaching the place. Likes to increase your property ranking and attract more travelers. Reviews shared from guests and updated to your listing. Administrative Access to your account for updates and charges. Customer Support to ensure you are a happy home owner.